A PAIR OF ORMOLU MOUNTED KAKIEMON VASES OF THE FORM KNOWN AS "HAMPTON COURT VASES"
porcelain then at Kensington House was given to the 1st Earl of Albermarle in 1699.
figures on them" (probably blanc-de-chine) flanking the jar. Also present in this overmantel arrangement were "two flasks of six square each", probably Kakiemon bottles. They were placed on the fifth shelf among various coloured pieces, including "little purple cups" and "white figures". 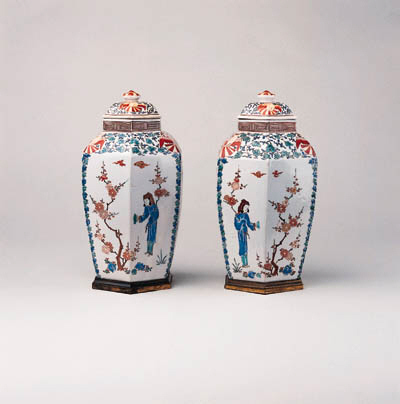 A similar example is illustrated Development of Kakiemon Type Enamelled Porcelain, Tokyo National Museum, March 1979, pl. 55. John Hardy and Linda Shulsky.